If donning a wetsuit and diving into an Arctic lake to get a look at underwater craters boiling up methane gas sounds like an exciting adventure, let me introduce you to Katey Walter Anthony, who did just that in an Alaska lake last summer. Last week, Dr. Anthony took a break from the meeting of the American Geophysical Union here in Washington, to offer a short briefing where she explained what she found. A bit of background: Methane (“natural gas”) like carbon dioxide, is a greenhouse gas. Greenhouse gases block infra-red radiation, reducing the amount of heat escaping from earth’s surface into space: Global warming. Methane is a more potent greenhouse gas than carbon dioxide, but it breaks down much faster. Dr. Anthony has been studying the dynamics of Arctic lakes for a couple of decades. Thermokarst lakes form when arctic soil begins to thaw, leaving voids where ice crystals have melted, causing the soil to subside. Last year, native Alaskan groups contacted Dr. Anthony seeking her help finding methane seeps which they hope to use as fuel in their remote villages. As lake bottoms thaw due to a warming climate, partially-decayed plants and animals, until now locked in permafrost, are starting to thaw and resume their decay, releasing carbon dioxide and methane. Increasing release of carbon dioxide and methane from thawing permafrost is one of about half a dozen amplifying climate feedback mechanisms that scientists have documented and begun to quantify. But what Dr. Anthony found at a lake that she named Esieh, just above the Arctic Circle, is even more troubling. She spotted the telltale signs of methane release — photos show that the lake doesn’t freeze over. And when she and her team arrived to set up camp, they were greeted by a steady eruption of grapefruit-sized bubbles rising to the lake surface. Carbon dating reveals that the gas is fossil methane, not the product of decaying material in permafrost, but gas from deeper geologic formations. Dr. Anthony surmises that as permafrost melts, it unseals fissures and crevices that connect to geologic gas deposits. It’s not clear yet whether Esieh Lake is an anomaly, or part of a larger pattern of thermokarst lakes with underground connections to geologic methane, which would have ominous implications for earth’s climate. What we do know, as Dr. Walter put it, is that “these lakes speed up permafrost thaw. It’s acceleration.” And that the amplifying effects of releasing fossil methane at an accelerating rate are not included in current climate models. “The Study of Earth as an Integrated System,” NASA (2017), https://climate.nasa.gov/nasa_science/science/. Author James HandleyPosted on December 18, 2018 December 19, 2018 Categories UncategorizedLeave a comment on Fast Thaw — What Are Arctic Lakes Telling Us? That’s not a rhetorical question. Jurisdictions around the globe have struggled for more than two decades to price carbon emissions. The results are mixed and frankly disappointing, judging by the number of policy failures, the small tonnage of CO2 emissions avoided or the global trend of rising emissions. But failure analysis can be a powerful teacher. The Wright brothers crashed a few airplanes and had to re-think their design before they built one that could stay aloft even for a short distance. Thus, meticulous analysis of carbon pricing policy experiments would be reason enough to recommend “Can We Price Carbon?” by Barry Rabe, professor of political science at the University of Michigan’s Gerald R. Ford School of Public Policy. But Rabe’s new book offers much more. It’s a thorough, readable, balanced and remarkably well-documented comparative overview of attempts at carbon pricing policy, primarily in North America, with abbreviated examinations of carbon pricing attempts elsewhere, all viewed through the lens of political science. Rabe, now steeped in climate policy, traces his interest in tax policy as a behavior-modifier to the 1970’s when he ghost-wrote for his father, a Chicago cigar salesman, under pressure to compose jeremiads against tobacco regulation and taxation. Rabe opens his book by sketching the history of excise taxes on tobacco, which in four decades have more than quadrupled the price of cigarettes while funding programs to further discourage smoking, cutting in half the number of cigarettes smoked in the U.S. and reducing the number of new smokers even more dramatically. After acknowledging the relentless chorus of entreaties from economists imploring climate policy to follow the tobacco example by “putting a price on carbon,” Rabe shows why carbon pricing poses a “super wicked problem” for political leaders. They understandably are reluctant to impose immediate and highly visible costs on their constituents in order to avoid inchoate future harm. And, of course, politicians also face a vocal minority who doubt that global warming is or will become a serious problem. Instead of carbon pricing, elected officials tend to prefer policies like procurement mandates, such as “Renewable Portfolio Standards” (RPS) adopted by more than half of states, requiring utilities to buy a specified fraction of their electricity from “renewable” sources. While RPS mandates offer a lighter political lift and have successfully expanded renewable electricity generation, economists point out that RPS’s represent a hidden, regressive cost, and do not push energy consumers to conserve and improve efficiency. Finally, because RPS’s typically are limited to a set of existing technologies, they do not to tend to spur research and innovation on new options in the way that robust carbon pricing would. Having set the stage, Rabe launches into “Why carbon pricing has often failed.” For me, as a climate policy advocate, this chapter feels like a spooky graveyard tour, with stops at President Clinton’s “BTU tax,” the 1400-page Waxman-Markey cap-and-trade bill that passed the House but expired in the Senate, Canadian Liberal Party leader Stephane Dion’s ill-fated (perhaps politically suicidal) “Green Shift,” Australia’s carbon tax (enacted, then promptly repealed after a anti-tax wave election), as well as state and provincial efforts including Manitoba and Alberta, the Midwest Greenhouse Gas Reduction Accord as well as the 2016 Washington state initiative, I-732. The graveyard tour foreshadows several of the book’s recurrent themes. First, the “hubris” of early carbon pricing advocates (including myself) who embraced the compelling economic logic of carbon pricing, hoping that enactment would follow and be “sufficient to launch and sustain it… much as… earlier policies such as Nordic carbon taxes and [U.S.] sulfur dioxide cap-and-trade.” Second, citing Alberta’s carbon tax as an example, Rabe warns that carbon pricing can be “used for symbolic purposes, enabling a government to look good politically through use of a heralded policy tool while not really accomplishing anything.” And finally, Rabe suggests ever-so-gently, that political constraints may not allow carbon prices to rise to levels that would justify eliminating complementary policies such as regulations and mandates. Barry Rabe, professor of political science at the University of Michigan’s Gerald R. Ford School of Public Policy. After his graveyard tour, Rabe turns the lights back on with “When Carbon Taxes Work,” focusing primarily on British Columbia’s “textbook” revenue-neutral carbon tax. By 2007, warmer winters in the province had eliminated the extreme cold needed to control the mountain pine beetle, now wrecking highly visible and widespread damage on British Columbia’s prized forests. Responding to public alarm, Gordon Campbell from the centrist Liberal Party campaigned on a carbon tax, inserting it as a “wedge” to win election in a three-way race. Campbell quickly enacted and rapidly implemented the tax, initially set at $10 (Canadian)/tonne CO2 and scheduled to rise to $30 in $5 annual increments. In 2009, Campbell handily won re-election, in what amounted to a referendum on the carbon tax. In addition to its remarkable popularity, several credible analyses concluded that BC’s carbon tax was even more effective than expected at reducing emissions, while BC’s economy grew faster than the rest of Canada. British Columbia’s Premier, Gordon Campbell enacted the province’s revenue-neutral carbon tax in 2008. As BC’s carbon tax was ramping up, its shale gas (“fracking”) industry began to boom outside the purview (and carbon-reducing influence) of the tax. Like most carbon taxes, BC’s carbon tax falls on fossil fuel consumers within the jurisdiction; it does not apply fossil fuel produced for export. This underscores a key point Rabe makes later in the book about the advantages of severance taxes imposed on fossil fuels at the point of extraction. Measured in total revenue, state severance taxes imposed by fossil fuel producing states are by far the largest “price on carbon” in North America. Seven, largely “red” states, including Alaska, North Dakota, Wyoming, Oklahoma and Texas have established durable and politically popular sovereign wealth trust funds. Texas and Wyoming rely heavily on trust fund revenue to support education. Unlike carbon taxes or cap-and-trade systems that impose costs on in-state consumers, severance taxes offer a unique political advantage: they fall primarily on out-of-state fuel consumers. Long before anyone proposed carbon taxes, severance taxes were established as important and reliable revenue sources in energy-producing states. In the 1980’s, when severance taxes faced threats of federal preemption, Wyoming Senator Malcolm Wallop thundered, “No one can calculate the impact of oil loss, of erosion, of loss of habitat for wildlife. Who makes the judgment that it exceeds legitimate social costs? Have you been to Wyoming and seen those social costs?” As Wallop’s quote vividly illustrates, a severance tax can build its own political constituency even in conservative energy-producing jurisdictions. A severance tax on BC’s shale gas production could surely offer enormous benefits, perhaps dwarfing the revenue and climate benefits of its now-stagnant carbon tax. Having offered British Columbia as a hopeful example of a carbon tax that worked (at least initially), Rabe plunges into examination of two U.S. cap-and-trade policies that have endured and enjoyed a modicum of success. In the Regional Greenhouse Gas Initiative (RGGI) an interstate emissions trading system covering the electricity sector in ten northeastern states, over-allocation of “allowances” (permits to emit CO2) has resulted in tiny prices (approximately one fifth of the price set by British Columbia’s explicit carbon tax), leading some observers to characterize RGGI as a “toy” or a “joke” of a cap-and-trade system. In response to such concerns, RGGI added a $2/T CO2 price floor which could be gradually raised to provide a more robust price signal while also augmenting its revenue stream over the long term. Despite RGGI’s anemic price signal, Rabe suggests that it “revolutionized” cap-and-trade into a revenue-producing system by auctioning all permits, rather than distributing most of them for free to emitters as previous cap-and-trade systems including the European Union’s Emissions Trading system (“EU ETS”) did and the 2009 Waxman-Markey bill would have done. Full auctioning of permits provides a steady stream of revenue for states to dedicate to energy efficiency, renewable energy and demonstration projects that have proven politically popular, contributing to the durability of RGGI, which at 16 years old, has outlasted every other cap-and-trade policy in North America. RGGI’s efficacy at reducing emissions remains less clear; but one particularly enthusiastic study concluded that the region’s emissions would have been 24% higher without the program. Gov. Schwarzenegger signs AB-32 into law in 2006. Next up is California’s cap-trade-offset program, AB-32 which Professor Rabe aptly describes as “a work in progress.” California chose cap-and-trade in part to work around the state’s requirement of a two thirds legislative majority to enact tax measures. The resulting legislation and regulatory framework starkly represent the antithesis of a simple, explicit carbon tax. By all accounts, AB-32 could not have launched and or been sustained without the diligent efforts of Mary Nichols, chair of California’s Air Resources Board (CARB), an agency whose resources and depth of expertise remain essential to administer the multi-faceted program. As in the EU ETS, “offsets,” which credit emissions reductions or carbon sequestration beyond the capped entities, offer an alternative compliance mechanism for emitters who would otherwise be required to buy allowances. Cheap and often questionable offsets have raised serious questions about the environmental integrity of California’s program. In response, CARB ratcheted up its oversight of offsets and cut the fraction of offsets available in its carbon market. California’s attempted linkages with other jurisdictions have also proved problematic. The latest is a link with Quebec which seems to be seeking new markets for its abundant hydro-electric power. Because much of California’s electricity is supplied from out of state, apparent “resource shuffling” to provide “renewable” energy to California while increasing fossil fuel generation for other states has raised concerns that net emissions reductions are chimerical. And finally, recognizing that price volatility and extremely low carbon prices undermine the fundamental purpose to “price carbon,” CARB added a “price floor” of $10/T rising 5% above inflation annually. These administrative “fixes” and “patches” illustrate Rabe’s point that cap-and-trade requires ongoing expert oversight and management to be workable and effective. As with other carbon pricing systems, revenue use dominates political debate about California cap-and-trade system. The lion’s share of auction revenue funds high speed inter-city rail, affordable housing and intra-city transit. California’s ETS faces ongoing challenges from environmental justice advocates who suggest that emissions trading concentrates emissions of CO2 as well as conventional health-damaging pollutants in disadvantaged communities. The Environmental Justice Alliance has called for replacement of California’s cap-and-trade system with a transparent carbon tax. Severance taxes which might provide simpler, more transparent mechanisms to price carbon, have thus far failed to gain enough political traction for enactment. Even with all its limitations, AB-32 wins accolades, having survived political upheavals, and like RGGI, has provided at least a modest “price on carbon” that could be augmented by revisions to the program, including a more aggressively-rising price floor. Rabe concludes with a chapter entitled, “A Second Act for Carbon Pricing” describing a range of new and ongoing efforts at the state and provincial levels to enact carbon pricing. Especially noteworthy are severance taxes in North Dakota and Colorado modeled on Norway’s politically-popular severance taxes that fund pensions. Rabe also suggests taxing the carbon content of fugitive methane emissions from shale gas drilling which to date have drastically reduced the potential climate benefits of shale gas as a bridge fuel. Finally, Rabe observes that the political obstacles to carbon pricing in the U.S. are not unique to our political system or culture. Carbon pricing remains challenging everywhere it is being attempted. After taking in Professor Rabe’s whirlwind tour of carbon pricing history, I was struck by the absence, even after a decade of relentless advocacy by Citizens’ Climate Lobby and more recently by the Climate Leadership Council, of legislation to enact “carbon fee and dividend” anywhere in the world. Perhaps returning revenue in lump sum “dividends” does little to help dissolve the “super-wicked” political dilemma that Rabe neatly articulated in chapter 2. The enactment and durability of RGGI, AB-32 and BC’s carbon tax were all aided by public support for proposals to spend or distribute revenue. Perhaps once a carbon price is established and is funding visible and popular programs, returning the additional revenue generated by a rising price might make political and economic sense. But given its almost total lack of political support to date, one has to question whether “fee and dividend” can serve as a starting point for politically-viable carbon pricing. P.S. (5/24/18). Alaska’s oil severance tax, which endows the state’s Permanent Fund, enacted by Republican Governor Jay Hammond in 1976, can be viewed as an example of an easily-implemented, popular and durable upstream ad valorem tax that could easily be converted to a more stable carbon tax. The Alaska tax, assessed on the dollar value of the oil extracted rather than its carbon content, is equivalent to about $53/T CO2. * The Fund currently distributes a $1600/month “dividend” to every eligible Alaskan. * $72/barrel (current oil price) x 35% (Alaska tax rate) x 1 barrel/433 Kg CO2 x 907 Kg/Ton = $53/T CO2. More than double BC’s “textbook” C$30/tonne ($22/T) CO2 tax! See, Henry Petroski, “To Engineer is Human, The Role of Failure in Successful Design” (1985) extolling the virtues of rigorous failure analysis. Rabe, “Can We Price Carbon?” at p. 200. As Rabe elucidates in detail, proponents of cap-and-trade as climate policy enshrouded the SO2 and CFC (“Montreal Protocol”) examples into exaggerated mythology that tended to overlook the more intractable problems of reducing CO2 emissions from a vast range of sources for which few ready replacements existed. See Rabe, “Failing the Performance Test,” pp. 74- 82. The Alberta carbon pricing system “hasn’t reduced a single ton of emissions yet,” according to David McLaughlin, one of Canada’s leading experts on carbon pricing, and former director of National Round Table on Energy and the Economy, in a keynote address to Canada’s Climate Choices Conference in Waterloo ON, February 18-20, 2016. Of course, the U.S. has no “centrist” party. Thus, the BC example offers little guidance about political strategy here. Rabe points out that BC’s carbon tax was fully operational in just five months. In vivid contrast, California’s cap-and-trade system with offsets took years to launch even with the heavy (and ongoing) staffing of its Air Resources Board. p. 95 and p. 168-9. I am grateful for the legal education I received in Texas, whose public universities are generously endowed by the state’s oil severance tax, paid overwhelmingly by gasoline purchasers in other states. RGGI participants are Connecticut, Delaware, Maine, Maryland, Massachusetts, New Hampshire, New York, Rhode Island, and Vermont . New Jersey has recently announced plans to re-join RGGI and Virginia is also considering that step. Rabe, p 157. Citing Brian C. Murray and Peter Maniloff, “Why Have Greenhouse Gas Emissions in RGGI States Declined” An Econometric Attribution to Economic Energy Market, and Policy Factors, Energy Economics 51 (2015). Rabe, pp. 168 – 9. Yes, Keep it in the Ground! To all appearances, mainstream scientific, environmental and policy organizations have been markedly less successful in organizing and spurring action to confront the climate threat. Beginning in 1979, the National Academy of Sciences issued lengthy, peer-reviewed surveys of global warming science. Early NAS reports estimated that continued fossil fuel burning would double atmospheric CO2 concentrations within a century, resulting in 2 deg C of warming. Based on painstaking studies of bubbles in ice cores that reveal CO2 concentrations in Earth’s paleoclimate history, scientists cautioned that 2 deg C of warming poses serious risk of catastrophically destabilizing Earth’s climate. And they warned that even a stable 2 deg C warmer climate would be far beyond the range in which our species (and most ecoystsems on Earth) have evolved and adapted. Alas, Nordhaus and other NAS collaborators deemed aggressive carbon pricing too radical and premature. Instead, their main policy recommendation was “further study.” That’s what has happened. Year after year, decade after decade, scientific studies continue to describe various aspects of the climate problem in ever more meticulous detail, but they largely temporize or abjure discussion of policy solutions. The scientific community’s hedged and often stilted warnings provided an opening for the well-funded climate science “doubt” industry to exploit. The “doubt industry” intones that stringent climate policies would be terribly costly, perhaps even destroying our economy, which the doubt industry asserts is inextricably and permanently tied to fossil fuel consumption. And they claim that nobody can prove that any climate policy is even needed. Economists have pointed out that revenue from carbon pricing can be recycled to eliminate regressive distributional effects and mitigate economic distortions. Despite such assurances, most U.S. politicians, even those concerned about climate have been only too happy to put off those hard choices. But a close look reveals that much of the resistance guide’s well-founded critique is based on the flaws and complexities of indirect carbon pricing through cap & trade with offsets. (Hereinafter abbreviated as “CTO.”) I’ve spent a decade researching, writing and advocating simpler, more direct carbon pricing policies that offer fewer hiding places for gimmicks and exclusions and instead provide clear, briskly-rising price signals to investors, innovators and consumers. Instead of auctioning all pollution permits,  CTO policies tend to distribute many of them free to polluters in order to grease the skids for enactment. That not only rewards past pollution, it cuts down on the revenue available to compensate disadvantaged communities. And as the guide articulates, the carbon offsets in CTO policies raise serious questions about indigenous rights and equally serious problems of monitoring, reporting and verification which have plagued the European Union’s Emissions Trading System. Carbon Taxes Are Different Than Gimmicky Cap & Trade with Offsets. In contrast, transparency, simplicity and an explicit revenue stream are key reasons why carbon taxes remain the most radical climate policy, even though they are grounded in mountains of peer-reviewed economic theory and analysis. Thus, I was distressed that the resistance guide lumps explicit carbon taxes in with complex, gimmicky CTO policies that, as the guide points out, have not induced the robust carbon prices needed for aggressive emissions reductions. The guide claims carbon taxes can “never” rise to levels high enough to reduce CO2 emissions to the degree needed. It’s true that carbon taxes, as enacted, and even most of those proposed, start too small and rise too slowly to hit consensus climate targets. And it’s true that economic models rarely seem to account for amplifying climate feedback; they discount or entirely exclude catastrophic scenarios so their damage estimates come out low. Twelve years ago, in a widely-cited Scientific American article, Princeton researchers Robert Sokalow and Steven Pacala described a path toward decarbonization broken down into 15 “carbon wedges” whose development and implementation would require a carbon price rising to $100 – $200 per ton within a decade. Eight years ago, a few carbon tax bills were introduced by House Democrats and one brave Republican (Bob Inglis) that aimed that high. Now, I know of no legislative proposals that even come close. So on the face of it, it’s true that carbon taxes are too small and grow too slowly to have much chance of hitting the kind of climate targets that climate scientists conclude would avoid catastrophic scenarios. We Need The Engagement of Environmental Justice, Climate Justice and Indigenous Environmental Groups to Enact Effective and Fair Carbon Taxation. The resistance guide further asserts that carbon pricing, even with substantial revenue directed toward assisting frontline communities, can “never” compensate for the historical environmental harms and future climate damage that disadvantaged communities endure. So the guide jumps to the conclusion that environmental justice, climate justice and indigenous environmental groups should unite to resist carbon pricing on a global scale. That advice overlooks the fact that frontline communities stand to benefit first and perhaps most from policies that mitigate or avoid climate damage. And sticking to the “false solutions” line would leave EJ, CJ and IE groups protesting outside while policy advocates and policymakers develop carbon pricing proposals, work which must be undertaken now if we are to be ready when the political tide turns. And the “false solution” rubric further ignores the robust body of economic analysis showing that regulatory programs, mandates and prohibitions create perverse incentives for other nations to free ride. Even quantity-based carbon pricing systems such as CTO lead to gaming. Only explicit carbon taxes with border tax adjustments offer potential to “go global” by aligning the incentives of nations to trade fairly and push for higher carbon taxes. The choice between “Keep it in the Ground” and carbon pricing is a false dichotomy. Recent economic analysis suggests that supply side (“Keep it in the Ground”) and demand side (Carbon Pricing) can work well together. The climate movement needs EJ, CJ and IE voices and organizations to keep the pressure on and to engage in designing carbon pricing policy — preferably in the form of transparent, upstream excise taxes on fossil fuel sources of carbon emissions — to assure aggressive prices and fair revenue distribution. Yes, CTO has proven problematic, as many of us warned. But if EJ, CJ and IE voices engage, transparent taxes on climate pollution offer a path to effective climate policy that embraces and enhances climate justice. Elizabeth Kolbert, “The Climate of Man Part II,” The New Yorker (May 12, 2005). A quarter century of “further study” has changed those initial estimates only slightly. Naomi Oreskes & Erik Conway, Merchants of Doubt, (2010) p 179, citing “Climate Change,” Nierenberg, et al (1983). Merchants of Doubt, p 169 et seq. “Countries made only modest climate-change promises in Paris. They’re falling short anyway,” Washington Post (February 19, 2018). Obama’s draft budget projects cap-and-trade revenue, Scientific American (February 26, 2009). See e.g., Ian Parry, Adele Morris, Roberton Williams, Implementing a US Carbon Tax: Challenges and Debates (2015). Carbon tax advantages emerge from modeling of four climate policy options. Careful, deliberate analysis of climate policy options and design choices might seem quixotic at a time when climate science is under siege from fossil fuel industry-funded front groups and the Trump Administration is aggressively rolling back climate policy and attempting to subsidize and revive the coal industry. Looking beyond current political obstacles, Lawrence Goulder (Director of the Stanford Energy and Environmental Policy Center) and Marc Hafstead (Director of the Carbon Pricing Initiative at Resources for the Future) offer a detailed quantitative comparison of four leading climate policy options, charting the deep, sometimes murky water of climate policy for the concerned public, climate policy advocates and policymakers. An explicit carbon tax on coal, oil and natural gas, reflecting the relative CO2 contributions generated by combustion of those fuels. Cap & trade. A quantity-based limit on total CO2 emissions. Tradeable permits are auctioned off, indirectly inducing a carbon price. A Clean Electricity Standard (CES) specifying the fraction of electricity generated from non-carbon sources. For the two carbon pricing options, Goulder and Hafstaed emphasize the importance of “recycling” revenue in ways that cut the overall cost of climate policy. Their modeling confirms and quantifies findings of numerous previous studies: Using revenue from carbon pricing to cut other taxes, especially taxes that create large distortions by inducing inefficient allocation and movement of capital and labor or reduced output, can substantially reduce the net economic costs of climate policy. In a seminal paper published in 1994, Prof. Goulder dubbed the potential for low or no-cost climate policy a “double dividend,” referring to the double benefits of more efficient taxation plus the benefits of reducing unpriced climate, environmental, and public health damage. Goulder and Hafstead’s new analysis concludes that the strong “double dividend,” where net policy costs are zero or negative, is as rare as the economists’ proverbial “free lunch.” It would occur only if the distortions from the tax whose revenue is being replaced by carbon revenue are so large that reducing them overcomes the costs created by a carbon tax: a reduced tax base and interactions with other taxes. But the weak double dividend, where policy costs are reduced (but not overcome) by the efficiency benefits of revenue recycling is far more easily obtained. Goulder and Hafstead’s E3 (energy-economy-environment, general equilibrium) model reveals the weak double dividend whenever carbon revenue is used to replace other distortionary taxes. By far the largest efficiency benefits arise from using carbon tax revenue to cut corporate income tax rates. Using carbon revenue to cut individual income tax rates produces modest efficiency benefits while cuts in employee payroll tax rates offer slightly smaller efficiency benefits. Returning revenue in lump sum fashion produces little or no efficiency benefit. Alas, while Goulder and Hafstead were assiduously analyzing the benefits of recycling revenue from carbon pricing and (presumably) rushing to publish their results, Congress and the Trump Administration cut the marginal corporate income tax rate from 32% to 21%, knocking much of the distortionary edge off U.S. corporate taxation. Nevertheless, given the robust economic literature suggesting a large excess burden from taxes on capital compared to other taxes such as income and payroll taxes, their ranking of the relative benefits of various tax shifting proposals should stand, even if some of their quantitative results have been overtaken by events. Goulder and Hafstead articulate and quantitatively illustrate the stark tradeoff between economic efficiency and distributional equity in the design of climate policies. They stress the need to account for both the regressive use-side impacts of carbon taxes, as well as their progressive source-side impacts. Their model includes both, providing a ranking of revenue options for distributional progressiveness which reverses the order of their ranking for economic efficiency. Lump sum rebates are most distributionally-progressive, followed closely by reduced employee payroll taxes and reduced individual income taxes. Finally, they find that reduced corporate income taxes are the least progressive option, though not necessarily regressive as commonly assumed. Goulder and Hafstead also analyze hybrid options: using a fraction of revenue to compensate households in the bottom two income quintiles while using the balance to reduce corporate income tax rates, similar to the carbon tax measure proposed by Rep. John Delaney (D-Md). As expected, these hybrids produce intermediate effects, trading off some efficiency for distributional equity. Goulder and Hafstead conclude that at low CO2 abatement levels, a Clean Electricity Standard (CES), which effectively sets a “floor” on the fraction of non-fossil fuel generated electricity, can be cost-effective even when compared to carbon pricing mechanisms. But they point out that carbon pricing surpasses the efficiency of a CES as CO2 abatement goals become more stringent over time. One key reason is that unlike a carbon price, a CES does not provide a price signal to electricity consumers to encourage conservation and efficiency. In effect, a CES amounts to a tax on fossil fuel energy, plus a subsidy to non-carbon energy, leaving consumer electricity prices essentially unchanged. And, of course, a CES is limited to the electricity sector, leaving out the industrial and transportation sectors, creating distortions across the economy. Finally, Goulder and Hafstead analyze the climate benefits of raising the gasoline tax. They conclude that while higher gasoline taxes do produce benefits that exceed their costs, especially when non-climate co-benefits are considered, higher gasoline taxes do not offer anywhere near the potential that economy-wide carbon pricing offers to reduce emissions. In fact, they conclude that while each of the other three policies could be designed to bring the U.S. close to meeting its commitments under the Paris Climate Accord, no conceivable increase in gasoline taxes could achieve that alone. Nevertheless, I might suggest modeling a gasoline (and diesel) surcharge added to an economy-wide carbon tax to compensate for the relatively low price elasticity in the transportation sector that makes it less responsive to carbon pricing than the rest of the economy. “Confronting the Climate Challenge” is written in somewhat technical language, but even to a lay reader, the book clearly illustrates economic concepts graphically and with salient examples. Goulder and Hafstead’s description of their E3 model and tabulations of results offer readers a look at how their general equilibrium model works, and gives a sense of the granularity of their analysis. The model divides the economy into roughly 40 industrial sectors; tabular results show the effects of various policy and revenue options on those industries. Graphical illustrations of distributional and regional costs and benefits flesh out the picture and remind us that design details can indeed matter just as much as policy choice. The four relatively diverse policies chosen by the authors seem to be the most politically viable both on the state and federal level. With progress on climate policy stalled at the federal level, states are showing increased interest in carbon taxes, cap-and-trade systems, clean energy standards (including the Northeast States’ Regional Greenhouse Gas Initiative). Even the long-taboo subject of raising gasoline taxes has come up in the context of infrastructure funding. Goulder and Hafstead take pains to point out that well-designed cap-and-trade systems can price carbon pollution as efficiently as carbon taxes, though they do not mention carbon offsets, an almost ubiquitous design element of cap-and-trade systems that has thwarted their effectiveness as price-setting mechanisms. Similarly, the authors do not mention the effect of price volatility which tends to muddy price signals and cloud long term price expectations in cap-and-trade systems. In their conclusion, Goulder and Hafstead mention that their modeling treats the rate of technological innovation as an exogenous variable. Thus, to the extent that carbon pricing induces or accelerates low- or non-carbon energy innovation, their estimates may understate the effectiveness of carbon pricing. Goulder and Hafstead also mention the possibility of preempting some existing (presumably redundant) climate policies if carbon pricing were enacted, noting that this would produce additional efficiency benefits. If Goulder and Hafstead’s carbon tax rates ($10, 20 and 30/tonne CO2 with a 4% annual increment) were more aggressive, the suggestion to preempt redundant policies might be more persuasive. They do not even attempt to model more aggressive carbon pricing (which if adopted globally) could offer a path to emissions reductions consistent with the IPCC’s 2 deg C target discussed in the book’s introduction. Perhaps even more frustrating, Hafstead’s elegant and easy-to-use online carbon tax calculator does not even allow carbon taxes that start higher than $50/ tonne or rise more briskly than 5% annually. Surely, if economy-wide carbon taxes with revenue recycling are indeed the most cost-effective and thus the most potent policy option, we should be encouraged to consider more aggressive options to reduce the risks of catastrophic scenarios including tipping points and amplifying feedback. One wonders if there would be any net environmental or climate benefit from increasing the gasoline tax in order to fund more fossil fuel and automobile infrastructure, a question not raised in the book. Goulder & Hafstead, p. 236. As Congress (perhaps furtively) begins to turn attention to tax reform, the Senate’s climate avatars Sheldon Whitehouse (D-RI) and Brian Schatz (D-HI) have updated their proposal to tax (and thereby discourage) carbon dioxide pollution,[i] the chief driver of global warming. Reaching across the partisan divide, Whitehouse and Schatz unveiled their “American Opportunity Carbon Fee Act”[ii] at a packed event hosted by the conservative American Enterprise Institute on July 26th. [iii] They touted both the climate benefits of a carbon price and the fiscal allure of $2.1 trillion in revenue that AOCFA would reap over a decade. The bill proposes to fund cuts in corporate income tax rates, rebate a portion of payroll taxes, fund a Social Security supplement for retirees, and provides block grants for states to help low-income and rural households and workers transitioning to new industries. At least from a revenue perspective, the bill represents an olive branch to conservatives and business interests who seek to reduce corporate tax rates, while also protecting low- and middle-income households from disproportionate impacts. AOCFA is elegant, concise and easily-understood. It’s an upstream excise tax on the carbon content of fossil fuels, the simplest and most direct way to begin to correct the market distortion that now omits the present[iv] and future costs of climate pollution from fossil fuel prices, making them seem cheaper than they really are. The tax would start at $49/T CO2 and rise 2%/year above inflation. 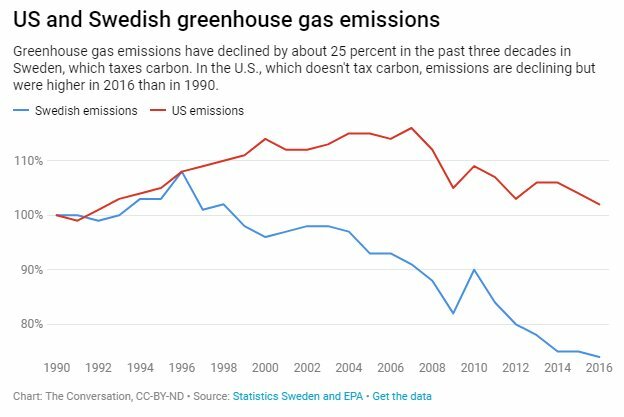 Unfortunately, 2%/year is not nearly enough to continue driving down CO2 emissions after the initial effects of the tax ripple through the economy. Two percent is about the expected annual rate of economic growth in the U.S.[v] Although the U.S. economy is slowly becoming less carbon-intensive, it’s still a fair guess that 2% economic growth will lead to roughly 2% annual increases energy demand for many more years. In short, even if similar carbon pricing trajectories were adopted globally, AOCFA’s 2% price trajectory is far too anemic to achieve even the most modest climate goals and is nowhere near aggressive enough to avert catastrophe. The Seven Percent (Climate) Solution? But despair not! There’s a relatively easy fix for AOCFA. A recent analysis by the World Bank’s High-Level Commission on Carbon Prices offered the results of six different integrated assessment models in three scenarios[vi]. In order to meet the goal of holding global temperature rise under 2 degrees Celsius, the models suggest that a carbon price will need to rise to roughly $500/ton CO2 by 2050. An upward ramp of 7%/yr would get us there just in time. The plots below tell the story. As you can see, if AOCFA’s price ramp were increased to 7%/year, carbon prices would reach the mid-range of the climate models’ price projections, roughly $500/ton CO2 by 2050, indicated by the orange curve. Hence, the 7% solution! [vii] Upgrade AOCFA’s anemic 2% annual increment to a more robust 7%, then we’d be looking at serious climate policy, offering a ~50% chance of averting catastrophe. [vi] “Report of the High-Level Commission on Carbon Prices,” Carbon Pricing Leadership Coalition, Chaired by Joseph Stiglitz and Nicholas Stern, (World Bank, 5/29/17). [vii] Pace, Nicholas Meyer (author of “The Seven-Percent-Solution,” reminiscences of Dr. Watson, Sherlock Holmes’ fictional assistant). Author James HandleyPosted on March 30, 2017 April 2, 2017 Categories UncategorizedLeave a comment on Carbon Pricing Deal in 2017?